Coronal Mass Ejections (CMEs) are not uncommon events in our solar system. Nitrate layers in Greenland ice cores suggest that large CMEs hit our planet, on average, once every 500 years; smaller ones, several times each century. Relatively minor CMEs affected our world in 1921 and again in 1960. Even within the past thirty years, several severe solar storms and CMEs have taken place and affected our planet. 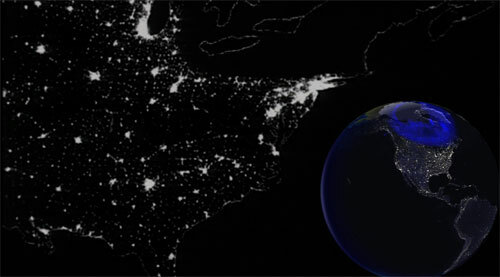 In 1989, complete loss of the power grid was seen in the Canadian province of Quebec leaving nearly 7 million people without electricity, the outage lasting 6 days. Between 1994 and 1997, severe solar geomagnetic storms were responsible for 600 million dollars worth of damage to orbiting communications satellites. In October 2003, a CME was detected and measures taken to prevent grid or communications damage but the blast was so strong that auroras were seen as far south as the Mediterranean. On July 14, 2003 (Bastille Day Event), a CME was launched, mostly missing the earth but reaching far enough out into space to be detected by the old Voyageur spacecraft. But the largest coronal mass ejection documented since 'modern' scientists were able to study the sun occurred in 1859. This CME is called 'The Carrington Event' (after the British astronomer, Richard Carrington). On September 1, 1859, only 17 hours after the massive solar flare was noted by Carrington, the CME slammed into our planet. Auroras were seen around the earth as far south as the Caribbean. Miners in the US Rocky Mountains awoke to a glow in the night sky that made them think that it was already morning. On the east coast of North America, people could read their newspapers as if it were daytime. Communication (telegraph) systems failed, giving electrical shocks to their operators and setting telegraph paper on fire. Some systems shut down completely but others continued to work despite being disconnected from their power source, power being fed to the machines through the static in the air! Today, we are much more reliant than in 1859 on electronic technology for our communications, travel even our weapon systems. So, what would happen in today's world if when our planet takes a direct hit by a coronal mass ejection? For an interesting video about The Carrington Event, click on the link below.